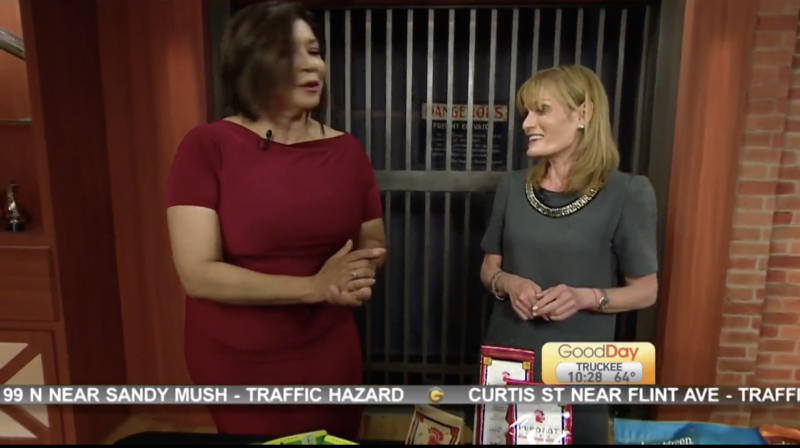 Daryn Mayer, healthful lifestyle expert and founder of you fortified visited CBS 13 Good Day Sacramento and shared her tips and favorite products for snackingand sipping. Good Day Chocolate makes premium chocolate supplements, and their Sleep Supplement is their #1 best-seller because of how effective (and delicious) it is. This Sleep supplement is a combination of melatonin – a hormone that our brains naturally produce on their own to trigger sleep but something we produce less of as we get older – along with soothing chamomile flower. Each piece is made with delicious Fair Trade milk chocolate, which is naturally low in caffeine, and candy-coated with colors from fruits & vegetables. Because each chocolate supplement contains 1 mg of melatonin, you can take exactly what your body needs to get your best night’s sleep. And it comes in these cute little convenient boxes with 8 pieces – perfect for travel and on-the-go sleep relief. Good Day Chocolate Sleep supplement and their other products, including Energy and Calm, can be found at Whole Foods, Sprouts, Kroger and other grocery store chains nationwide as well as online at GoodDayChocolate.com and Amazon.